This NASA graphic depicts the orbit of asteroid 2013 TX68, which flew by Earth on March 7, 2016 at a distance of about 2.54 million miles (4.09 million kilometers). 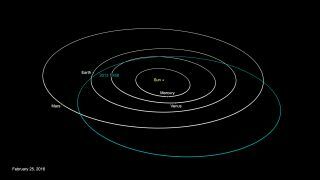 An asteroid zoomed past Earth at a safe distance Monday (March 7), a day earlier than scientists had predicted. The near-Earth asteroid 2013 TX68 flew by our planet at 8:42 a.m. EST (1342 GMT) Monday at a distance of 2.54 million miles (4.09 million kilometers), according to researchers at the Minor Planet Center in Cambridge, Massachusetts, who pegged the object's diameter at between 56 and 177 feet (17 to 54 meters). Scientists had thought 2013 TX68's flyby would happen on Tuesday (March 8), but the early encounter doesn't come as a huge shock. The asteroid's orbit is not known precisely, leading to large uncertainties in flyby predictions. For example, researchers initially thought the closest approach would occur Saturday (March 5), then pushed it back to Tuesday. And the range of closest-approach distances was estimated to be anywhere between 15,000 miles (24,000 km) and 3 million miles (5 million km). Despites this wide range, there was never any danger of an impact from 2013 TX68 on this pass, NASA scientists have stressed. In fact, the asteroid — which circles the sun once every 780 days or so — poses no threat to Earth for at least the next century. Rocks the size of 2013 TX68 could potentially cause damage on a local scale if they hit Earth. For example, the object that exploded over the Russian city of Chelyabinsk in February 2013, damaging buildings and injuring more than 1,200 people, is thought to have been about 65 feet (20 m) wide. 2013 TX68 was discovered in October 2013 by astronomers working with the Catalina Sky Survey in Arizona.